Wow, such words: “…I regret to inform you that no encouragement can be offered relative to favorable action being taking in your case at this time.” The whole thing is a fantastic display of outdated formal business language. I wondered if the signature is real or if it was penned by an administrative assistant. 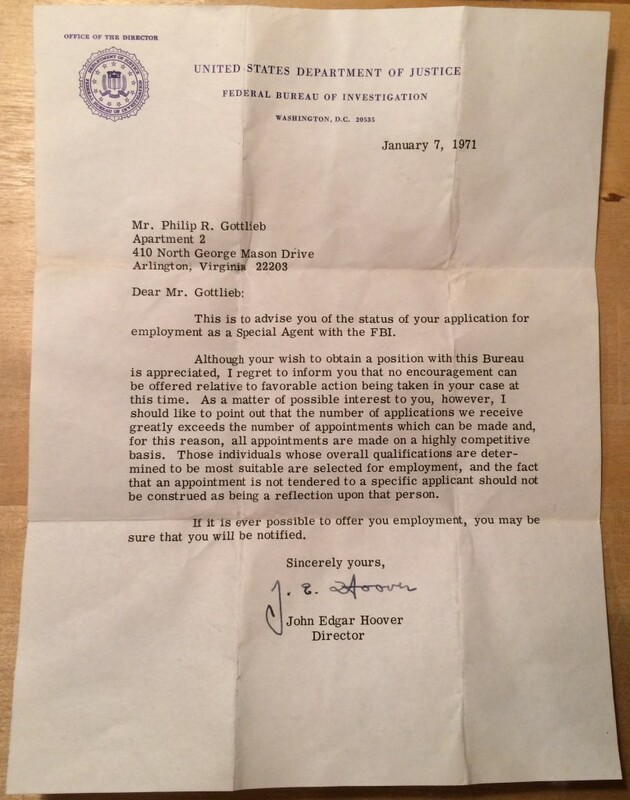 I’d assume Hoover would have had more important things to do, like investigating John Lennon or rounding up subversives or whatever, than to personally sign all of the FBI rejection letters. But a quick Google search brings up similar looking signatures with the distinctive J and H. Cool! If I don’t know what to do with this in the future, maybe I’ll make a few bucks on eBay. It’s funny that an old rejection letter might be worth something. I also tried to figure out what my dad might have been up to in 1971. The Vietnam Conflict was winding down, and his first wife might have already divorced him and taken custody of their two sons by then; maybe he didn’t know what to do with himself? I think he ended up becoming a Sky Marshal around that time before moving on to a series of odd jobs including truck driver, bartender, and AAA driving instructor, which is how he met my mom. (Uh, romantic?) Also cool! I think it’s safe to conclude without the slightest bit of exaggeration that if J. Edgar Hoover hadn’t rejected my dad from the FBI, there would be no Debbie. Yep, that’s right. Thanks, Hoover! Next Next post: Horn Lines, The Signature Sound of Today’s Pop Hits?